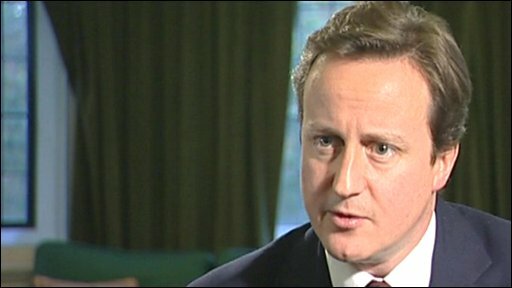 The Conservatives are dropping their pledge to match Labour's spending plans for 2010/11, leader David Cameron says. The Tories had promised to match the totals for Labour's spending plans from 2008 to 2011 - subject to a review in 2009 of the 2010/11 spending total. But Mr Cameron said he wanted to create a "low-tax, low-debt economy" and called on Gordon Brown to "deal with the situation he has given us". Labour accused the Tories of "turning their back" on people needing help now. Chancellor Alistair Darling said Mr Cameron was out of step with the rest of the world, with other nations also planning to pump money into their economies in a "fiscal stimulus" aimed at staving off a slump. He told BBC News: "There is a consensus, here and across the world that at this time, governments need to support people, need to support businesses and the wider economy." 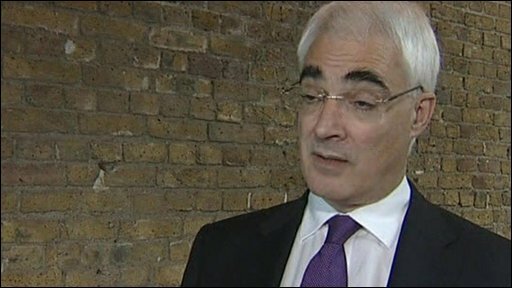 Mr Darling is expected to unveil a package of tax cuts and public spending in his pre-Budget report next week . He said: "We need to be more efficient and we will be more efficient. We are already exceeding the targets we set ourselves for government spending, in making ourselves more efficient and cutting back on waste. "I think we can do a lot more and on Monday, at the pre-Budget report, I will be setting out what more I think we can do." The Tory leadership has been under pressure from party members to outflank the government on tax cuts, but Mr Cameron ruled out any measures that could not be paid for. He accused the prime minister of planning to "throw money at the crisis in the faint hope that this will help recovery". Mr Cameron said Britain was different to other nations because it already had high levels of public debt. He warned that Mr Brown's proposed "fiscal stimulus" was merely storing up tax rises for the years to come - and that a £30bn injection to the economy would mean an 8% rise in income tax later. In a shift in Conservative economic policy, he said: "To stop future tax rises, the growth rate of spending in 2010/11 will have to be lower than the growth rate laid out by Labour. "The growth rates of spending in the years beyond 2010/11, pencilled in by the chancellor last year, are also now unsustainably high." He said Labour's current spending plans were based on "heroic assumptions" about Britain's prospects for economic recovery and the tax receipts it would generate. Mr Cameron called on Mr Darling to use next week's pre-Budget report to reduce his figures for spending growth beyond 2011/12. This would be the first year of a Conservative government if the party won a general election in 2010 - the latest date Mr Brown could call one. Mr Cameron told the BBC: "I'm saying the spending growth has got to be put back. We need to recognise that we cannot go as we are." He said of Mr Brown: "He's prime minister of the United Kingdom, not of any other country. He's got to deal with the situation he has given us." "People are not fools. They know that Gordon Brown's plans have to be paid for." But Liberal Democrat leader Nick Clegg said the Conservative announcement was "economic madness". "To simply slash public spending when we are heading into a recession - there's no case for it whatsoever."